Thank you for all of the sweet comments in yesterday’s wrap-up. 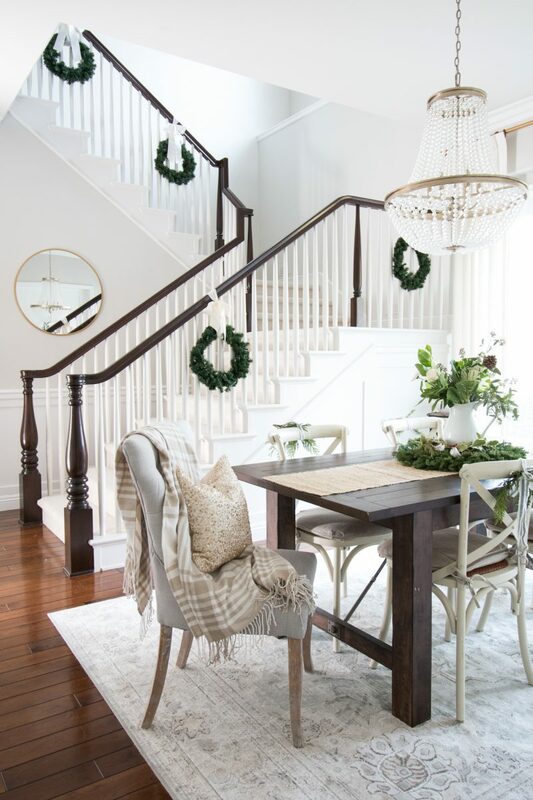 While we are not decorating for Christmas until after Thanksgiving, now is the time to gather inspiration and pick up things here and there you might need to make your vision come to life. 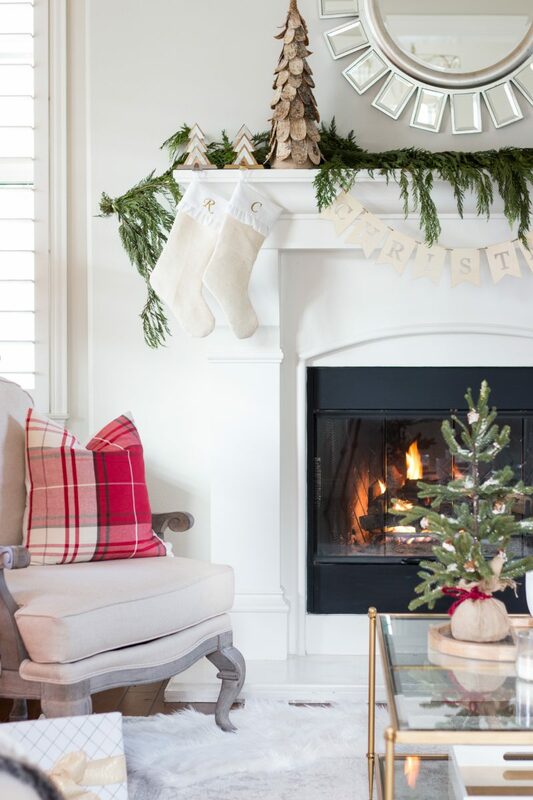 So today I am sharing some of my Christmas spaces to get the creative juices flowing. It’s by far my very favorite time of the year and I can’t wait to see the home filled with sparkling lights again. We had so much fun working on this tree last year. Except for the part where my son ate the icing of the homemade gingerbread men. We strung popcorn, made cookies and loved creating a “Home Sweet Home” tree for our very first Christmas in this house. It was inspired by a tree my parents have in their kitchen every year. Strung popcorn and all! Receiving Christmas cards ranks right up there as one of my very favorite parts of the season. There is just something so special about walking to the mailbox each day and seeing the faces of the people we love. Last year we hung them across a prominent wall so we could see them on a daily basis. 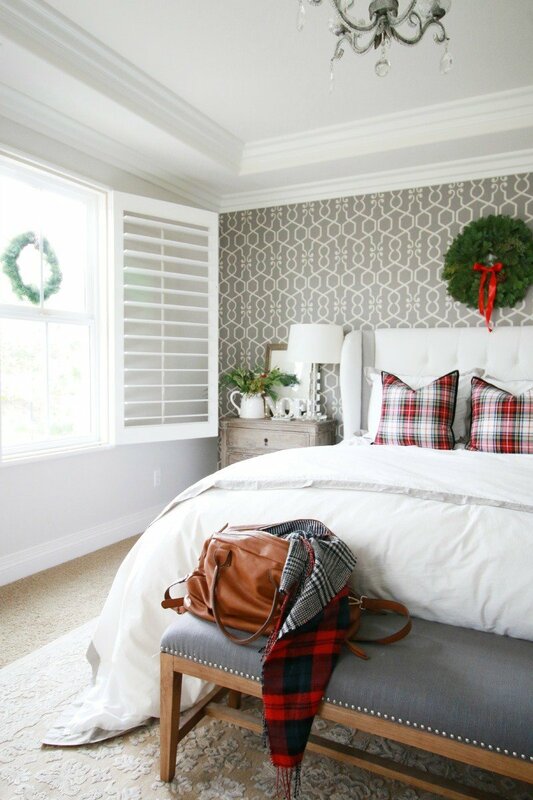 Add a festive wreath (this one is from Target) and you are ready to go. I styled this bar car two different ways. Always a fan of creating a party with just a bar cart. It keeps everything in one spot and you can do so much with a small space. The kids are voting for another hot cocoa bar this year. I think we will make one for Christmas Eve. I’ve seen bottle brushes around town again this year. They make for a really sweet tablesetting. I bought this plaid satin fabric at Joann’s but I’ve seen plenty of plaid tablecloths at HomeGoods this season. To create the centerpiece, we laid a plank of wood ( I stained it dark) down the center. I used the glue gun to lightly adhere the trees so they would not topple over. They pop right off so you can disassemble everything. For the most part, I keep things very minimal. 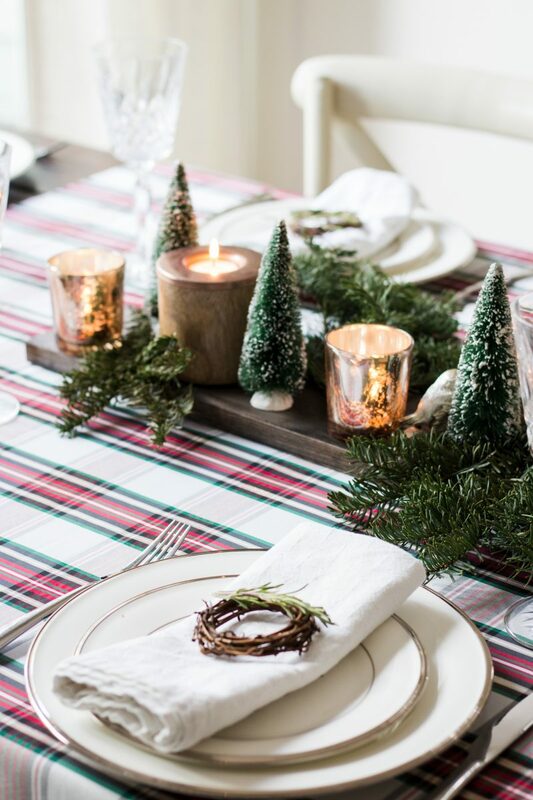 A few greens tied to the backs of stools or chairs look so festive. I don’t use my bottom oven on a daily basis so it’s easiest to add a holiday towel to that one. In this case, I just folded plaid fabric and used gold sticky letters from Michaels to create my own. 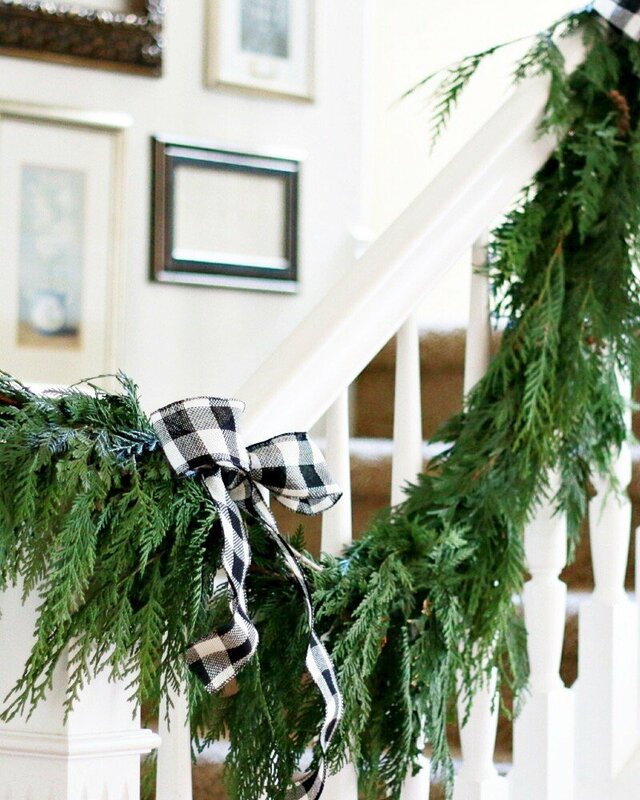 In the past, we have always hung garland on our railings. Last year was the first time I used simple wreaths and I will be doing it again this year. I loved the clean look and it was so easy to do. 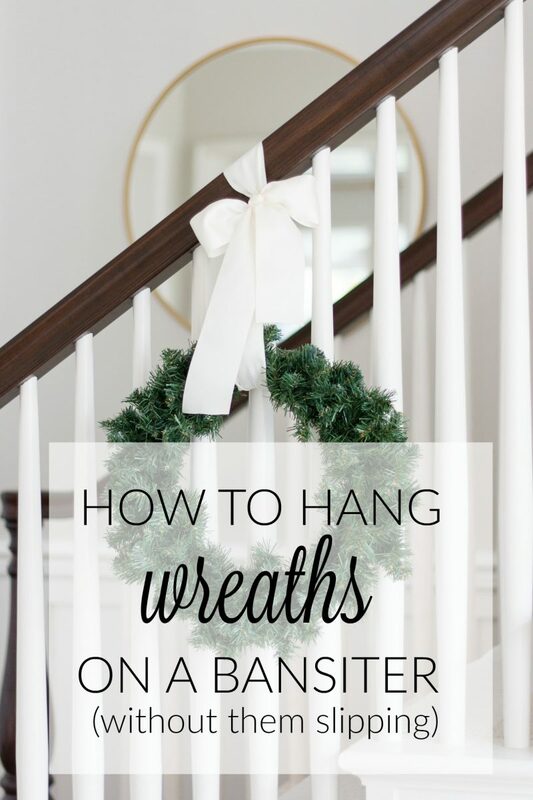 While it’s a simple and clean look, there is a trick to hanging the wreaths so they don’t slip on the slanted railing. There is a video in the post to show you how to to do it. In our previous home, I used the Trader Joe’s fresh garland. It’s my favorite and I plan to use it in our home this year. They don’t last all season, but if you are lucky they will give you a good two weeks or so! One of my favorite spaces was our bedroom. This was in our previous home and I loved the way the wreath looked over the white bed. The plaid pillows are from HomeGoods. Definitely look soon if you are wanting one or two. They go quickly and now is the time to scoop them up before they are gone. Lots of creamy neutrals with pops of red will be on tap again. I love the traditional feel of it. And that is another Trader Joe’s fresh garland on the mantel. The banner is from Michael’s and the stockings are from Etsy years and years ago. 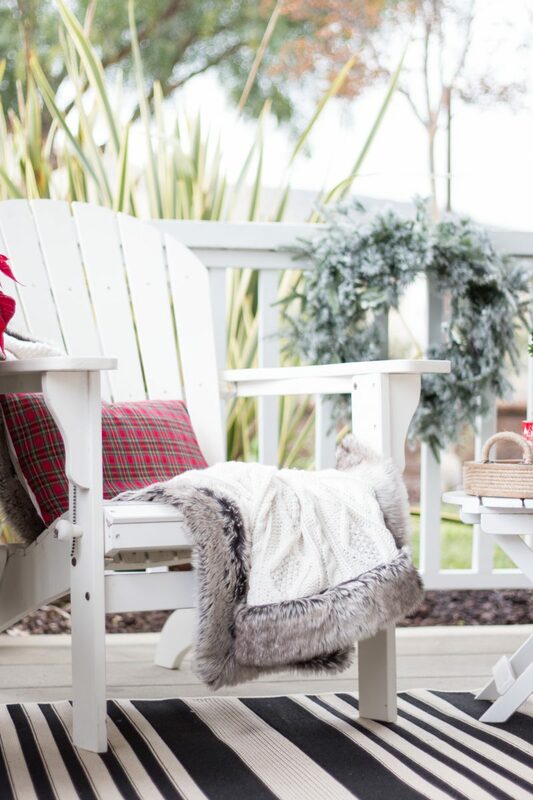 If you have an outdoor space, it’s a really fun to create a cozy and welcoming Christmas scene. One day I dream of filling this corner with a Christmas tree. But I better cool my jest as we still have spots indoors that need some love. Always so fun to look back at the spaces that brought so much joy. I can’t wait for the weekend after Thanksgiving to unpack all of our Christmas boxes and jump in to decorating. We crank up the holiday tunes, make hot cocoa and savor the process. As I’ve mentioned, we definitely feel most at home when the house is decorated in a traditional way. 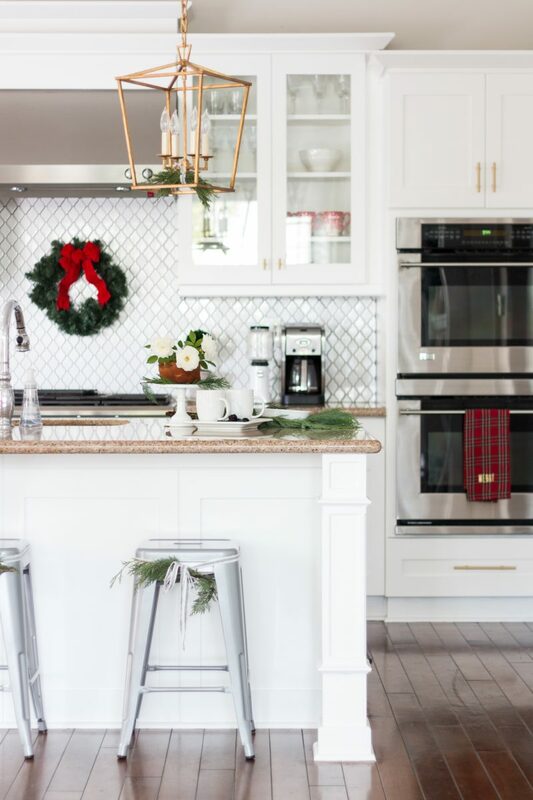 I love adding gold, silver, pops of red and natural elements to each room. I do a lot with garland, wreaths, satin bows and ornament displays. Just placing a bowl of gold ornaments on a coffee table looks beautiful. I just ordered that flocked tree! So excited. I’ve always wanted one and finally went for it. It should arrive shortly. They sell out so quickly so I went for it. 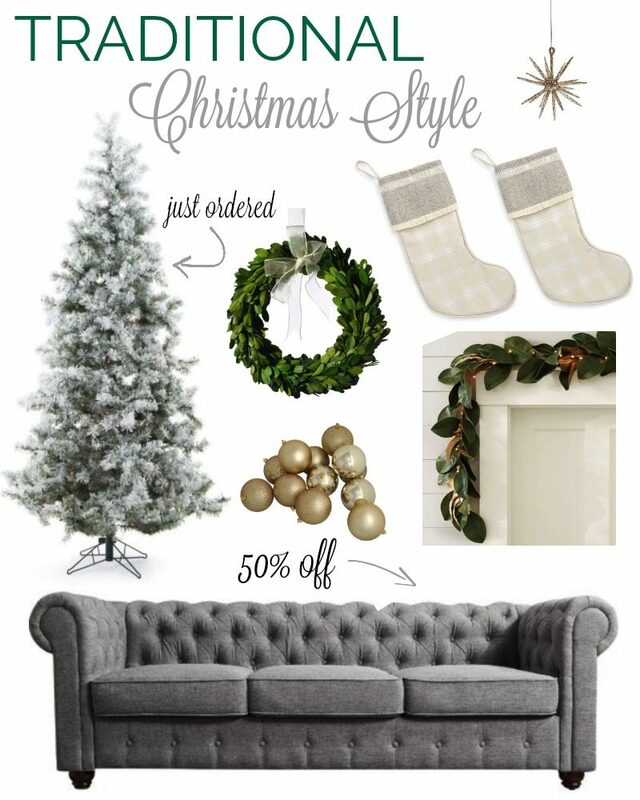 One of our very favorite pieces of furniture in our home is our gray Chesterfield sofa. The Wayfair version is 50% off. That is huge. We can’t say enough about this style. Everyone in the family loves it and this one has received rave reviews. So if Santa is snooping around for a new sofa, this could be a great place to start. Hope this gets your holiday spirit sparked! I know we can’t wait to enjoy Thanksgiving and then get our Christmas on! Enjoy your day, sweet friends. I am lucky and get to spend time with both my aunt and sister today. Nothing like a little bit of girl time. See you tomorrow. Courtney I need you for a month at my house Both to decorate and de clutter! Hi Courtney! 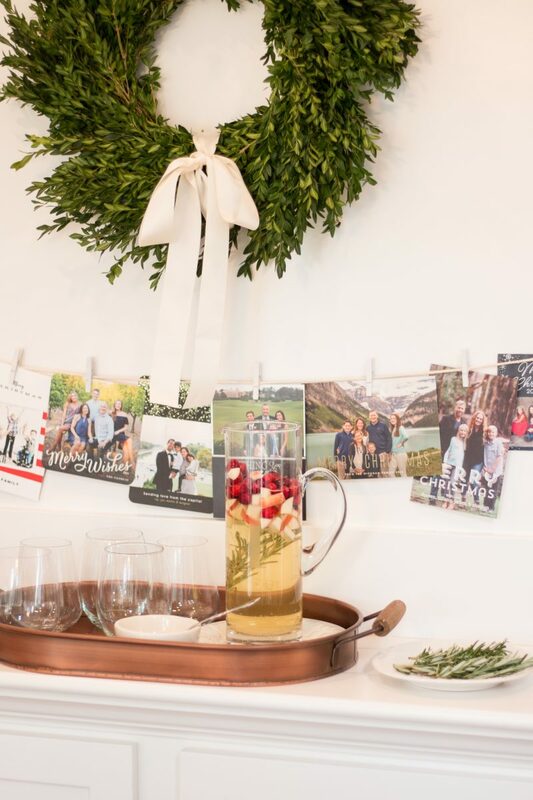 I always try to hang my holiday cards just like this, and the twine/ribbon I use always ends up getting too weighed down and falling off the wall- what do you use to string the cards, and how do you attach it to your walls? thanks! I am like a kid over here so excited to decorate for Christmas but am waiting until after Thanksgiving. We always start the day after. You do a beautiful job every year Courtney. I have wanted a flocked tree for years! I remember my parents got me a little one for my bedroom as a little girl. Happy Tuesday! 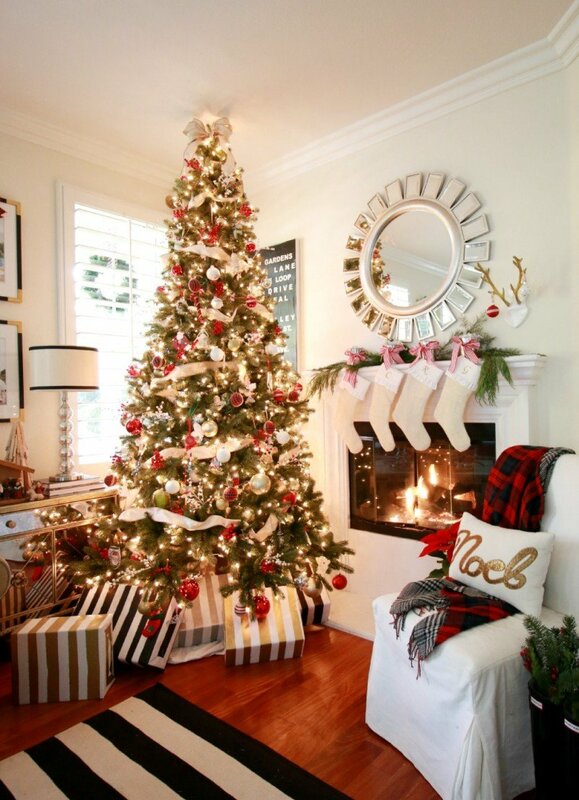 Loving your traditional tree! 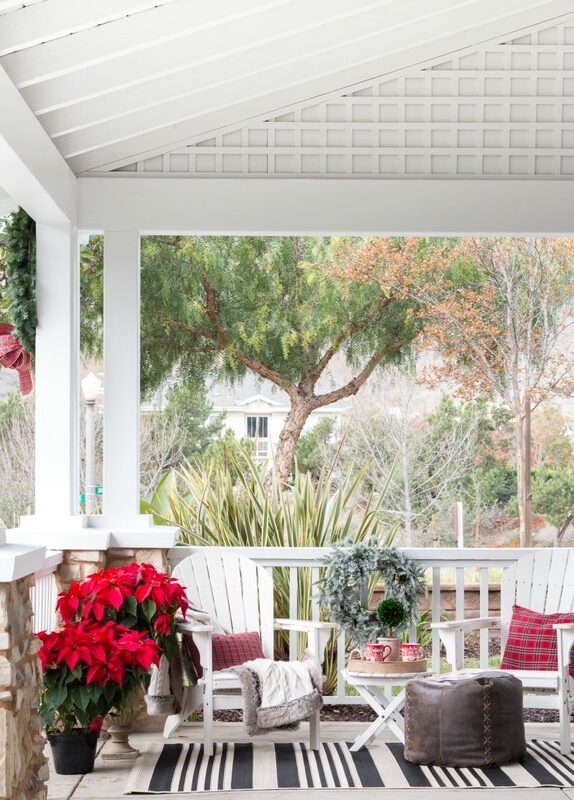 And loving your wraparound porch, that’s so hard to find in SoCal! We also start decorating the day after Thanksgiving. Can’t wait for Trader Joe’s to get their fresh greenery in – just picked up advent calendars last night. Happy holidays! 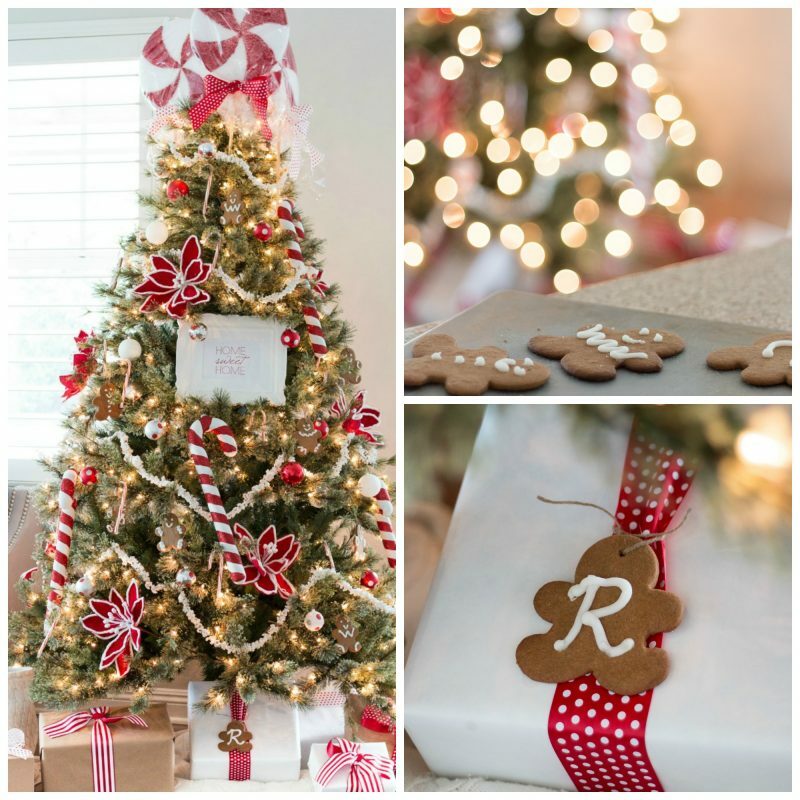 Any tips on decorating your tree with ribbon? Bought a couple spools but not quite sure how to make it look nice.